(1982) and The Young and the Restless (1992). 1965: On As the World Turns, Ellen Stewart (Patricia Bruder) told her husband, David (Henderson Forsythe), about a Christmas long ago when she was pregnant. Their conversation was interrupted by Paul (Edmund Gaynes) and Dan (Jeffrey Rowland), who opened a gift from his grandmother. Later, David told Ellen he already knew about her child. 1968: On Dark Shadows, Barnabas Collins (Jonathan Frid) found Joe Haskell (Joel Crothers) had been attacked by the werewolf and took him back to Collinwood. Later, Chris Jennings (Donald Briscoe) turned into a werewolf in front of Joe. Joe shot the werewolf with a gun, but it did not kill him. 1971: On Another World, in their kitchen, Jim and Mary Matthews prepared for the holidays. While Jim marveled at how how Mary was able to organize everything for large family parties, she reminded him that she had 30 years of experience doing so. They discussed how much it meant to them to have their family over for Christmas Eve. Later, when the guests arrived, Jim advised John not to let his growing work responsibilities take priority over Pat and the twins. Russ' date, Dr. Paula McCray, told everyone that she grew up in boarding schools and always missed out on family gatherings like this one. Steven and Alice discussed her pregnancy, their relationship, and Steve's seeing Jamie...and Rachel. Everyone gathered to sing Christmas carols. 1976: On Ryan's Hope, the Ryan's celebrated Christmas. Mary Ryan (Kate Mulgrew) placed the star on the tree while the family sang "We Three Kings." Meanwhile, a wheelchair-bound Jack Fenelli (Michael Levin) had a meltdown leading Mary's father, Johnny (Bernard Barrow), to blurt out, "Dammit, Jack. You ought to get down on your knees and thank God Mary is carrying this child, because it's the only one you'll ever have!" 1979: On Guiding Light, Ed Bauer (Mart Hulswitt) read the story of the first Christmas to the children at Cedars Hospital. Later, family and friends gathered at church where Mike Bauer (Don Stewart) sang "O Come All Ye Faithful," "Joy To The World" and "The First Noel." 1979: On The Edge of Night, it was Christmas Eve in Monticello. Miles (Joel Crothers) realized that Mrs Corey was Nola Madisson. 1982: On Search for Tomorrow, Keith wondered why Andy was so remorseful and unhappy on Christmas Eve. Andy's mood grew worse when Wendy (Lisa Peluso) dropped by and gave him a book of poetry as a present. At Stephanie's (Maree Cheatham) Christmas Eve party, Brian and Martin (John Aniston) discussed Brian's new job at the television station. And at Joanne's (Mary Stuart) party, everyone was rehearsing Christmas carols until Joanne lead everyone in a special, traditional Christmas song. In the meantime, Stephanie listed her New Year's resolutions to Martin as her party began to thin out. Later in the night, Andy caught Stu (Larry Haines) bringing over presents to the house, and he read from the book of poetry Andy just received. 1982: Helene Udy debuted as Frannie Hughes on As the World Turns, just in time for Frannie's birthday. Elsewhere, David and Ellen were remarried and Dee was suspected in the "death" of John Dixon. 1982: On Another World, Mac Cory (Douglass Watson) read a Christmas story to his daughter, Amanda, and then he and his wife, Rachel (Victoria Wydham), reminisced about their first Christmas on the estate. 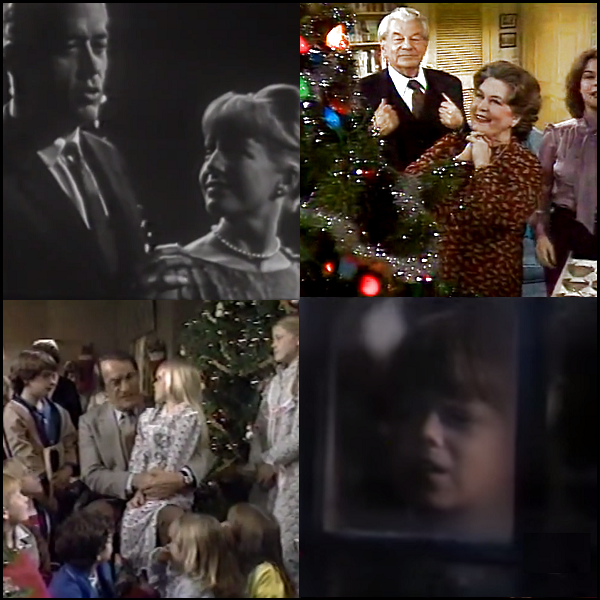 1982: On General Hospital, Dr. Steve Hardy (John Beradino) read the annual Christmas story to the kids. 1985: On As the World Turns, the Hughes family and close friends celebrated Christmas Eve and Frannie's (Julianne Moore) birthday. Even a mysterious gift could not dampen the mood as carolers arrived to serenade the group. 1986: On Search for Tomorrow, Jo (Mary Stuart) wondered why things couldn't be like they were in her dream. 1992: On The Young and the Restless, Nicholas Newman (John Nelson-Alden) was excited to receive a soccer ball and a battery-operated car for Christmas. Nick's father, Victor (Eric Braeden), watched his family celebrate the holiday from outside the window at the ranch. 1992: On As the World Turns, Margo Hughes (Ellen Dolan) got the results of her HIV test. Lily (Heather Rattray) left town. 1996: On One Life to Live, Todd Manning (Roger Howarth) wanted to see Blair Cramer (Kassie DePaiva) and baby Starr at Christmas. 1999: The Young and the Restless added actor names to its opening theme sequence. 2002: Paul Rauch's final episode as executive producer of Guiding Light aired. 2002: On As the World Turns, Natalie Snyder was born. 2003: On Guiding Light, Blake (Elizabeth Keifer) threw a Christmas Eve party for Mel, Rick, Holly and Edmund, during which she and Ross (Jerry verDorn) were married. 2003: On The Bold and the Beautiful, the Forresters sang "Joy to the World" at their family Christmas celebration. 2004: On Guiding Light, Zach Spaulding received a present -- a butterfly -- which his father had arranged for delivery before his death. The insect escaped from its case and set "the butterfly effect" in motion: a series of events where the fate of one character directly affects a stranger, and then another. The chain resulted in a reunion between estranged sisters Reva Shayne Lewis (Kim Zimmer) and Cassie Winslow (Laura Wright); Bill Lewis found the victimized Olivia Spencer (Crystal Chappell) in Ravenwood Asylum; Harley Davidson Cooper had a romantic rendezvous with old flame Gus Aitoro; and a one-of-a-kind moment between Lizzie Spaulding, Coop Cooper and Lizzie's antler-clad dog, Roxie. 2012: Actor Charles Durning, who originated the role of Gil McGowan on Another World in 1972, died at age 89.